Klebsiella oxytoca DSM 29614 - isolated from acid mine drainages - grows anaerobically using Fe(III)-citrate as sole carbon and energy source, unlike other enterobacteria and K. oxytoca clinical isolates. The DSM 29614 strain is multi metal resistant and produces metal nanoparticles that are embedded in its very peculiar capsular exopolysaccharide. These metal nanoparticles were effective as antimicrobial and anticancer compounds, chemical catalysts and nano-fertilizers. The DSM 29614 strain genome was sequenced and analysed by a combination of in silico procedures. 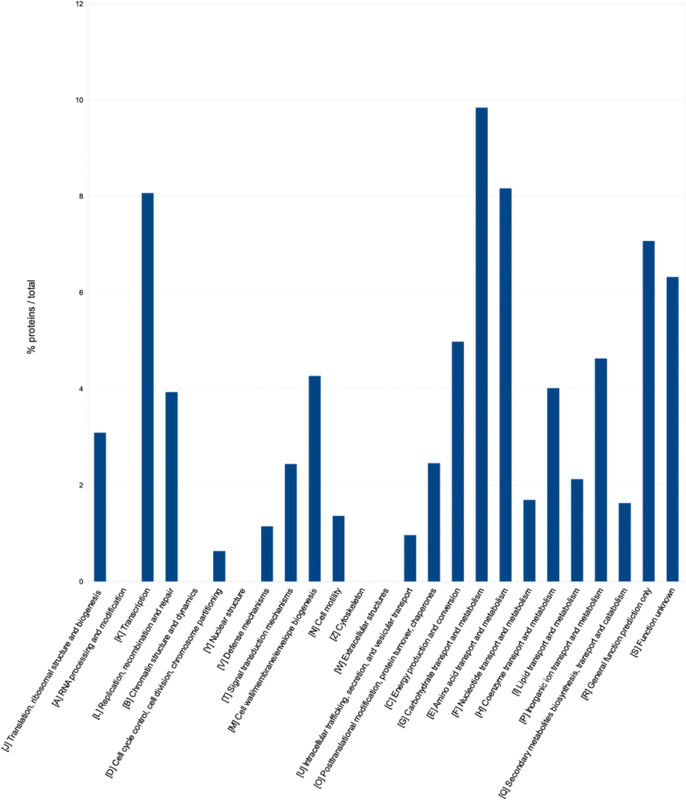 Comparative genomics, performed between 85 K. oxytoca representatives and K. oxytoca DSM 29614, revealed that this bacterial group has an open pangenome, characterized by a very small core genome (1009 genes, about 2%), a high fraction of unique (43,808 genes, about 87%) and accessory genes (5559 genes, about 11%). Proteins belonging to COG categories “Carbohydrate transport and metabolism” (G), “Amino acid transport and metabolism” (E), “Coenzyme transport and metabolism” (H), “Inorganic ion transport and metabolism” (P), and “membrane biogenesis-related proteins” (M) are particularly abundant in the predicted proteome of DSM 29614 strain. The results of a protein functional enrichment analysis - based on a previous proteomic analysis – revealed metabolic optimization during Fe(III)-citrate anaerobic utilization. In this growth condition, the observed high levels of Fe(II) may be due to different flavin metal reductases and siderophores as inferred form genome analysis. The presence of genes responsible for the synthesis of exopolysaccharide and for the tolerance to heavy metals was highlighted too. The inferred genomic insights were confirmed by a set of phenotypic tests showing specific metabolic capability in terms of i) Fe2+ and exopolysaccharide production and ii) phosphatase activity involved in precipitation of metal ion-phosphate salts. The K. oxytoca DSM 29614 unique capabilities of using Fe(III)-citrate as sole carbon and energy source in anaerobiosis and tolerating diverse metals coincides with the presence at the genomic level of specific genes that can support i) energy metabolism optimization, ii) cell protection by the biosynthesis of a peculiar exopolysaccharide armour entrapping metal ions and iii) general and metal-specific detoxifying activities by different proteins and metabolites. The genus Klebsiella embeds different Gram-negative rod shaped bacteria including human pathogens , harmless nitrogen–fixing plant endosymbionts , and polluted soil inhabitants [3, 4]. Klebsiella oxytoca (formerly known as Klebsiella pneumoniae or Aerobacter aerogenes) is a free-living bacterium isolated from soils , plants and animals, including humans. K. oxytoca strains can be either pathogenic  or beneficial having roles, for instance, as plant growth promoters [3, 6] and as valuable biochemical-compound producers . The strain K. oxytoca DSM 29614 (ex BAS-10) was isolated under an iron hydroxides mat from an acid drainage of a pyrite mine at Metalliferous Hills in Southern Tuscany, Italy [8, 9]. Interestingly, this strain is able to grow using Fe(III)-citrate as sole carbon source under anaerobic condition, producing Fe(II) from Fe(III) and a peculiar exopolysaccharide (EPS) containing rhamnose, glucuronic acid and galactose [10, 11]. The EPS is produced also in the presence of toxic heavy metals, such as Cd2+, Pb2+ and Zn2+ , As+ 5 and As+ 3 , and Hg2+ . In such conditions, metals often precipitate with EPS in the form of metal nanoparticles embedded in the EPS polymer. This biotechnological peculiarity was used to produce biogenerated “green” metal nanoparticles (NPs) containing: Fe [15, 16], Pd, and Rh that were used for catalytic reactions [17–19]; bimetallic Fe-Pd clusters that were used for hydrodechlorination of chlorobenzene  and Aroclor 1260 ; Ag that exerts antimicrobial [22, 23] and anticancer  activities. Recently, the Fe(III)-EPS was used as a nutraceutical compound in order to improve growth rate of the commercial fungus Tuber borchii by improving Fe3+ uptake . Proteomic analysis performed by 2D-Differential Gel Electrophoresis (2D-DIGE) and mass spectrometry (MS) procedures revealed that protein differential regulation seems to ensure efficient cell growth coupled with EPS production by adapting metabolic and biochemical processes in order to face iron toxicity and to optimize energy production . Altogether, these characteristics prove insights into the remarkable biotechnological usefulness of this bacterium. Given such an encouraging picture, the aim of this work was to investigate the K. oxytoca DSM 29614 genetic features accounting for the synthesis of EPS and heavy metal resistance conferring, thus, the capability of diverse metal nanoparticle (NP) production. To this scope, the K. oxytoca DSM 29614 genome was sequenced and analysed by a combination of in silico procedures. Moreover, a set of phenotypic tests was carried out to corroborate the achieved genomic insights. Cells of K. oxytoca DSM 29614 (ex BAS-10) strain were stored in cryovials at − 80 °C in 25% glycerol solution until they were retrieved using Difco Nutrient Broth (BD Bioscience, Italy) growth medium at 30 °C. Aerobic and anaerobic cultivations were performed as described in Buttacavoli et al. (2018) . When the strain was grown in the presence of heavy metals either the NaC or FeC media were used. The NaC medium contains per liter of distilled water: 2.5 g NaHCO3, 1.5 g NH4Cl, 1.5 g MgSO4.7H2O, 0.6 g NaH2PO4, 0.1 g KCl, and 14.7 g Na(I)-citrate (Carlo Erba, Italy). The NaC medium was buffered at pH 7.8 with a solution of NaOH. In the FeC medium 50 mM Fe(III)-citrate replaces 50 mM Na-citrate . The growth of the strain was monitored determining total protein content by using Protein Assay kit (Bio-Rad, Italy), based on Bradford dye-binding method (1976) , according to manufacturing instruction for micro-assay. K. oxytoca DSM 29614 strain was grown at 30 °C using Difco Nutrient Broth (BD Bioscience, Italy) growth medium. The genomic DNA was extracted using the CTAB method  and the authenticity of the genomic DNA was confirmed by 16S rRNA gene sequencing (Ylichron Srl, Italy). Whole genome shot-gun sequencing was performed by using the Illumina HiSeq system (Illumina Inc., San Diego, CA) with a paired-end approach loading genomic DNA onto one single flowcell (BGI-HongKong Co. limited, Hong Kong). 16S rRNA gene sequences from strains belonging to K. oxytoca were selected from NCBI ftp site to run a phylogenetic analysis. 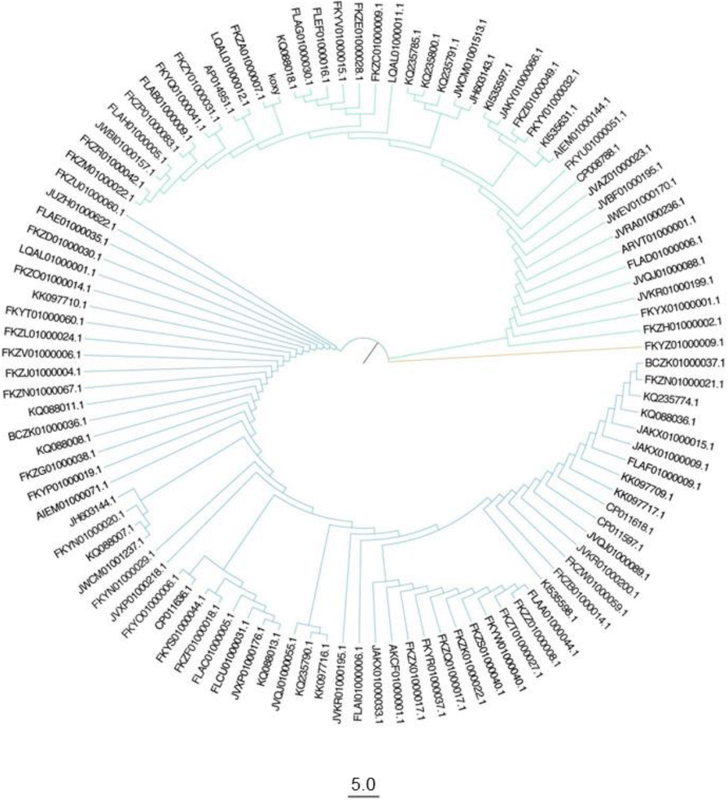 Sequence alignment and phylogenetic tree were obtained as previously described in Presta et al. (2017) . Poor quality bases were removed using the dynamic trimming algorithm embedded in the SolexaQA suite  selecting a Phred score threshold value of 13. Assembly was performed by using ABySS 1.3.7 software . The resulting contigs were launched in a multidraft-based scaffolder MeDuSa  which starting from 307 initial contigs generated 62 scaffolds. The last ones were then annotated by using NCBI Automated Genome Annotation Pipeline. All the 85 K. oxytoca representative (Additional file 1: Table S1) genomes sequenced up to date (i.e. September 2016) were collected from the NCBI ftp site (ftp://ftp.ncbi.nlm.nih.gov/genomes/refseq/bacteria/Klebsiella_oxytoca/all_assembly_versions/) and, alongside K. oxytoca DSM 29614 genome, they were analyzed using Roary software  to identify shared orthologous and strain-specific genes. AntiSMASH software  for genome-wide identification, annotation and analysis of secondary metabolite biosynthetic gene clusters was used to scan the genome sequence of K. oxytoca DSM 29614 in order to identify gene clusters involved in secondary metabolite production. BacMet database  was used to identify the genetic elements responsible for heavy metal resistance, by using BLASTp algorithm with a threshold e-value ≤0.0001 and percentage identity ≥30. Protein functional enrichment analysis was performed using the SmartTables tool at BioCyc database collection  with the option “Fisher Exact Parent-Child Union” (FEPCU) on. Two analyses were performed on the sets of differentially abundant proteins (Additional file 2: Table S2) obtained from the proteomic analyses described in Gallo et al. (2012) . In particular, up-regulated proteins i) in FeC versus NaC in anaerobic condition and ii) in anaerobic versus aerobic FeC cultivations were used. For these analyses, the K. oxytoca 10–5243 (NCBI accession JH603143.1) was chosen as reference strain since it was the most related strain among the selectable ones at BioCyc database collection according to the phylogenetic tree based on K. oxytoca 16S rRNA gene sequences (Fig. 1). Aliquots of 10 ml of of DSM 29614 anaerobic culture in FeC medium were sampled at different times. The samples were firstly centrifuged to eliminate bacterial cells, then precipitation of polysaccharides was induced by treating the supernatant with 8 ml of cooled ethyl alcohol (95%). The purification phase was repeated twice. The concentration of total carbohydrate in EPS was quantified spectrophotometrically (485 nm) as glucose (Fluka, Germany) equivalents after reaction with 96% sulfuric acid (Fluka, Germany) and 5% phenol (Fluka, Germany) . Iron removal from polysaccharide was performed by treating the rusty gel with 100 mmol l−1EDTA (Fluka, Germany) until it was colorless . In order to quantify iron species in K. oxytoca DSM 29614 cultivations, 3-ml aliquots were collected at different times and processed for colorimetric assay as previously described in Baldi et al. (2009) . A 100 ml of NaC medium was inoculated with 1 ml of K. oxytoca DSM 29614 (OD600nm = 0 1 ABS) and after 3 h of incubation at 30 °C, each culture was amended with 5 mg of Ag(NO3), Hg(NO3)2 or Pd(NO3)2 (Sigma-aldrich, Germany). The cultures were incubated at 30 °C in static mode until colloidal material and the crystals precipitated. Crystals were easily separated by filtration from colloidal fraction and the determination of crystal was performed with X-ray-Diffractometry (Bruker D8, Italy) with 40 kV and 40 mA geometry with Cu Kα (λ = 0.154 nm) radiation. The micro-crystals formed in the cultures added with Pd2+ were observed by optical microscopy (Axio-Imager Z1stand, Zeiss, Italy) equipped with Axiocam MRm 2.8 in transmission and in fluorescence modes. The specimens were stained with DAPI (Fluka, Germany) to observe cells involved in crystal precipitation. A Pd-EPS aliquot of 1 mg was suspended in 1 ml of milli-Q water and sonicated for 10 min. Then, in order to obtain TEM images a 5 μl aliquot of each suspension was processed as previously described in Battistel et al. (2015) . Total metals in 10 mg of crystals from K.oxytoca DSM 29614 culture was determined in triplicates. The sample was mineralized with aqua-regia for 4 h at 70 °C. The total metals were determined by flameless Atomic Absorption Spectroscopy (Varian SpectrAA 250 Plus, Italy). The K. oxytoca DSM 29614 cells were harvested from aerobic and anaerobic NaC and FeC media without metal additions and with additions of AgNO3, Hg(NO3)2 or Pd(NO3)2 (Sigma-aldrich, Germany). The cells were harvested by centrifuging, washed and then recovered in 5 ml of carbonate buffer constituted by 0.095 M NaHCO3, 0.005 M Na2CO3, 0.1 M NaCl, 0.05 M MgCl2, at pH 8.5. Aliquots of 3 ml of cell suspension were lysed on ice bath by a Vibra-Cell VC50 sonicator (Sonics & Materials, Newtown, USA), equipped with a 3-mm microtip. Two cycles of 45 s of pulsed sonication (30 s of pulse and 15 s of pause) were performed for each sample. The sonicator was set to 20 kHz, with a power output of 50 W. Cytosol with phosphatase activity was collected after centrifugation (20 min. at 14,100 g). The supernatant was recovered, filtered (0.02 mm pore size) and stored at − 20 °C until phosphatase assay was performed . The supernatant (cytosol) and the pellet (cell membranes) were characterized for total protein concentration by Coomassie Blue dye (Biorad, Italy) assay protocol . The enzymatic activity was determined in the presence of different concentrations of the fluorescence substrate MUF-PO4 (Sigma-Aldrich, Germany)  in order to determine Vmax and Km. The florescence intensity was measured by using a spectrofluorometer (Victor mod. X2, Perkin-Elmer). The fluorescence excitation (Eex) and emission (Eem) wavelengths were set up at 380 and 480 nm, respectively. The calculation of phosphatase activity (PA) was performed within a range of MUF-PO4 between 10 to 1000 μM. The PA activity is expressed as “IU”, namely the enzyme activity unit, which transforms 1 μM per minute of substrate. Than the PA, reported as international unit (IU), is normalized to the cell biomass calculated as grams of proteins (gPRT). The whole-genome shotgun project has been deposited at NCBI WGS database under the accession number MKCU00000000 and the version reported in this work was named MKCU01000000. The genome is 6,257,287 bp long with a GC content of 51.85%, similarly to other members of the same species. Other main features of the genome are reported in Table 1. Comparative genomics analyses were performed between all the 85 previously named K. oxytoca representatives (Additional file 1: Table S1) and K. oxytoca DSM 29614; the phylogeny of the genus has been also investigated and the diversity and composition of the global gene repertoire has been studied through the pangenome approach analysis, as described in Materials and Methods. Despite the phylogenetic analysis revealed that the 16S rRNA coding sequences can be included into three main clusters (Fig 1), the phylogenetic history of these organisms appears to be very complex. 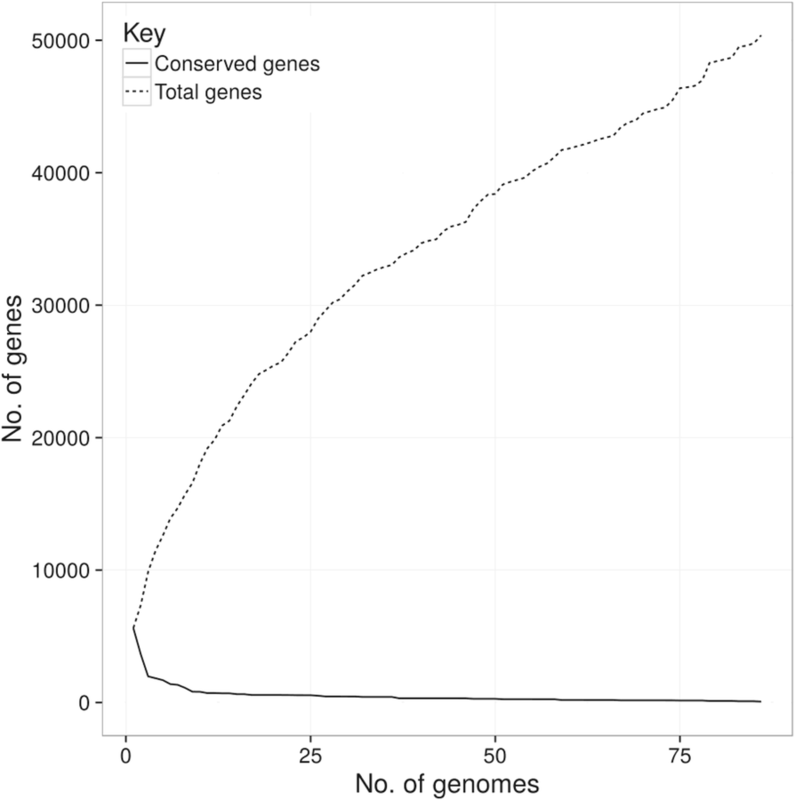 In this regard, the data obtained by evaluating the number of conserved genes vs. the number of total genes (plotted in Fig. 2) revealed that this group of microorganisms has an open pangenome - i.e. 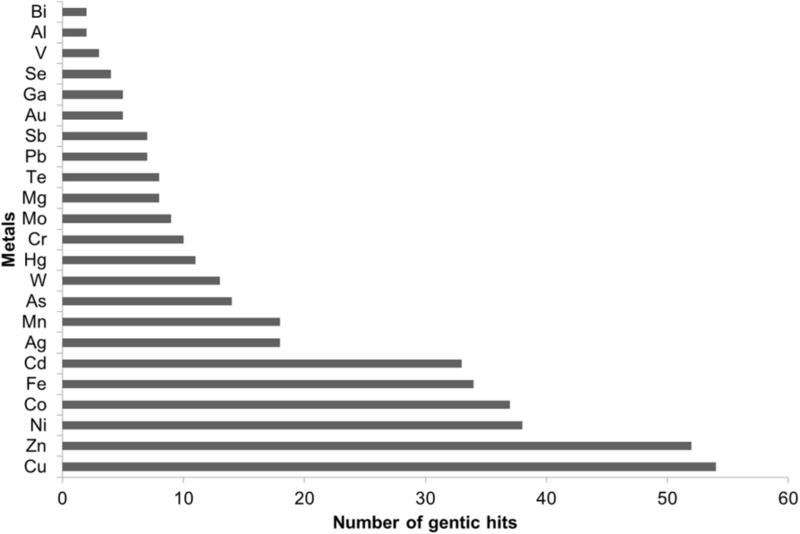 the number of unique and accessory genes increases with the number of genomes embedded into the analysis. Moreover, Fig. 3 shows the size of unique, accessory and core genomes. The core genome, here presented as soft-core and proper core, consists of 1009 genes (about 2% of the total), whereas there is a high fraction of unique (43,808 genes, about 87%) and accessory genes (5559 genes, about 11%). A deeper functional characterization of K. oxytoca DSM 29614 genome has been obtained by mapping its open-reading frames (ORFs) to the COG database . 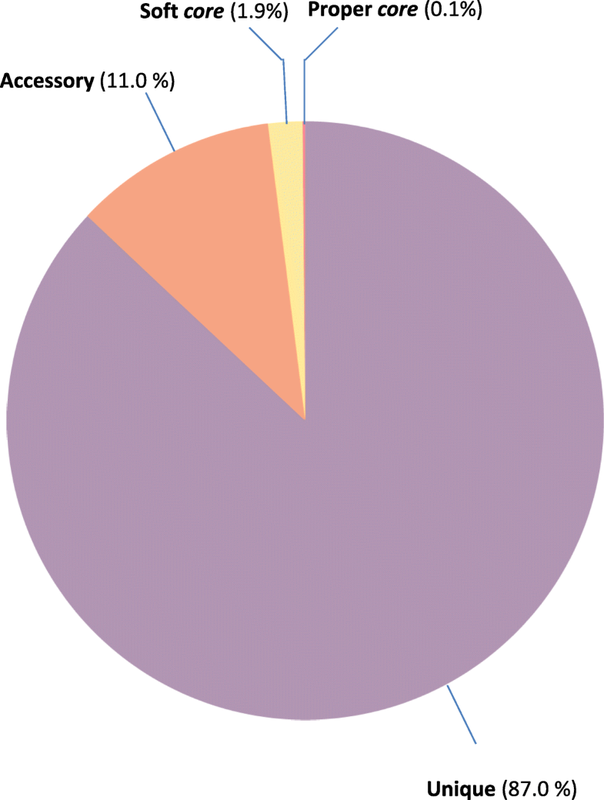 Data obtained are shown in Fig. 4 reporting the abundance of genes assigned to each category. Such analysis revealed that proteins belonging to COG categories “Carbohydrate transport and metabolism” (G), “Amino acid transport and metabolism” (E), “Coenzyme transport and metabolism” (H), “Inorganic ion transport and metabolism” (P), and “membrane biogenesis-related proteins” (M) are particularly abundant in the predicted proteome. According to previous data , medium acidification occurs when DSM 29614 strain is incubated in presence of citrate under anaerobic conditions while medium pH is stable when the strain is incubated aerobically in presence of citrate (Fig. 5a). Indeed, the DSM 29614 strain genome contains the genes encoding citrate lyase (CitEF), Na+-dependent membrane oxaloacetate decarboxylase (OadA), pyruvate formate lyase (PFL), phosphotransacetylase (PTA) and acetate kinase (ACK), that are the enzymes required for anaerobic citrate utilization . Interestingly, the differential representation of these enzymes was already described in two differentially abundant protein sets in Gallo et al. (2012) . In the present work, these two protein sets (Additional file 2: Table S2) were used for a BioCyc-based functional enrichment analysis whose results are available at the internet address https://biocyc.org/smarttables as BioCyc Public Smart Tables “Enriched with FEPCU from anaerobic Vs aerobic growth on FeC up-regulated proteins” and “Enriched with FEPCU from FeC Vs NaC during anaerobic growth up-regulated proteins”. In particular, these results revealed an up-regulation of enzymes belonging to i) a super pathway including glycolysis, pyruvate dehydrogenase, TCA and glyoxylate bypass, ii) fermentation pathways including the one forming acetate, and iii) anaerobic respiration during anaerobic utilization of Fe(III)-citrate as carbon and energy source. Thus, this result further supports the capability of the DSM 29614 strain to optimize energy production. Another intriguing aspect of DSM 29614 strain is the massive reduction of 50 mM of Fe3+ to 22 mM Fe2+ during anaerobic growth on FeC medium (Fig. 5b). A BLAST interrogation revealed that the genome of DSM 29614 strain does not contain genes homologous to those found in Shewanella – like cymA, mtrABC operon, mtrF and omcA - or in Geobacter – such as omcS, omcT, dhc2 and pccF - involved in dissimilatory Fe(III) reduction [43–46]. However, the DSM 29614 strain possesses genes that can have a role in iron transport and reduction. Among them there are: fecABCDE operon (BI322_RS14055- BI322_RS14075) that is devoted to Fe(III)-citrate uptake in bacterial cells ; genes encoding flavin metal reductases, like the flavodoxin FldA (BI322_RS16850), the NADPH-dependent ferric siderophore reductase (BI322_RS21400), the succinate dehydrogenase flavoprotein subunit (BI322_RS16715), and the flavocytochrome C (BI322_RS10335); genes encoding ion efflux pumps, such as the cation transporter FieF (BI322_RS11975) [45, 48]. In particular, the NADPH-dependent ferric siderophore reductase is one of the 33 gene products involved in iron tolerance predicted in DSM 29614 strain genome (Fig. 6; Additional file 3: Table S3), and both the succinate dehydrogenase flavoprotein subunit and the flavocytochrome C are predicted to play a role in the anaerobic respiration of fumarate according to KEGG database. Indeed, the succinate dehydrogenase flavoprotein subunit was upregulated in anaerobic FeC cultivation in the respect of both aerobic FeC cultivation and anaerobic NaC cultivation as previously revealed by differential proteomics . In addition, the ability to produce bioactive compounds capable of acquiring Fe(III) was revealed by antiSMASH analysis showing the presence of a turnerbactin biosynthetic gene cluster (from BI322_RS17265 to BI322_RS17505). Indeed, turnerbactin is a triscatecholate siderophore synthetized through a Non Ribosomal Peptide Synthetase, which was firstly isolated from the shipworm endosymbiont Teredinibacter turnerae T7901 . 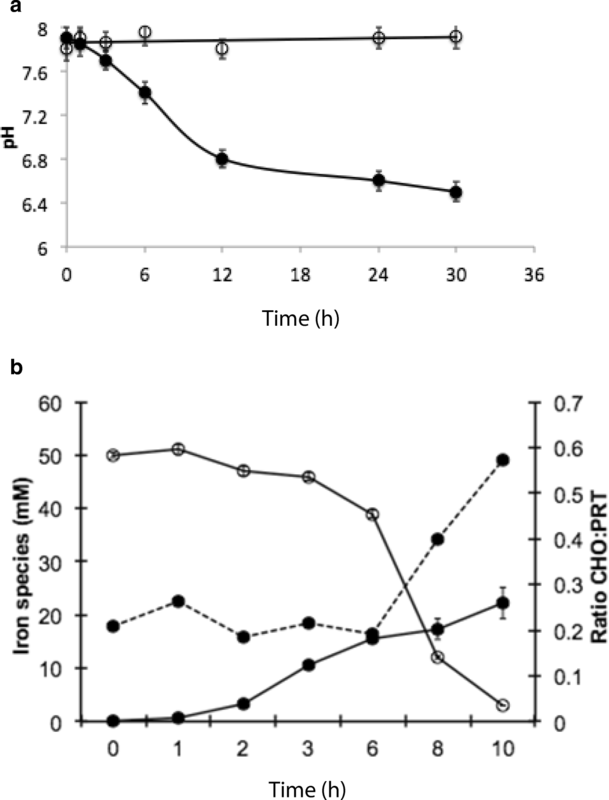 A crucial contribution to tolerance to high levels of iron can be ascribed to the peculiar EPS produced by DSM 29614 strain which promotes metal ion entrapment and reduction. In fact, when the strain grows anaerobically in the presence of FeC, in concomitance to the Fe3+ reduction to Fe2+, iron also precipitates in the bacterial EPS (Fig. 5b; Additional file 4: Figure S1) . In these growth conditions the pH is low and the citrate is consumed, but the increased ratio between polysaccharides (CHO) and cell proteins (PRT) in harvested cells at stationary phase demonstrated an overproduction of EPS (Fig. 5b). Two cps gene clusters, namely cps1 and cps2 (Tables 2 and 3, respectively) were identified in the genome supporting the capability of K. oxytoca DSM 29614 cells to synthesize the EPS. Indeed, some features of cps1 and cps2, including their corresponding flanking regions in the genome, highlight peculiar characteristics of K. oxytoca DSM 29614 as described in (Additional file 5: Supporting Information). Wza is required for the translocation of capsular polysaccharide through the outer membrane. Wzb shows phosphatase activity towards the autophosphorylated Wzc protein, which induces colanic acid biosynthesis; catalyzes the phosphorylation of UDP-glucose dehydrogenase, an enzyme involved in colanic acid biosynthesis. Wzc catalyzes the autophosphorylation on tyrosine residues which downregulates the biosynthesis of colonic acid (an extracellular polysaccharide). This family of proteins are related to the EpsG protein from Bacillus subtilis. These proteins are likely glycosyl transferases belonging to the membrane protein GT-C clan. Glycosyltransferase like family 2; Members of this family of prokaryotic proteins include putative glucosyltransferase, which are involved in bacterial capsule biosynthesis. Glycosyltransferase, GT2 family, putative dTDP-rhamnosyl transferase. Membrane protein involved in the export of O-antigen and teichoic acid. Periplasmic protein involved in polysaccharide export. Serine acetyltransferase involved in the biosynthesis of colanic acid, an exopolysaccharide expressed in Enterobacteraceae species. In addition to tolerance to high levels of iron, the DSM 29614 strain possesses a high level of tolerance to diverse metals such as Pd, Rh, Cd, Pb, Zn, As, Hg and Ag as already mentioned. Therefore, in order to detect genetic elements putatively responsible for this capability, BacMet database  was used to scan the DSM 29614 strain genome. This investigation allowed to detect 149 genes putatively responsible for specific resistance to a total of 23 different kinds of metals (Fig. 6; Additional file 3: Table S3 and Additional file 5: Supporting Information). K. oxytoca DSM 29614 genome contains typical pho regulon genes  - like phoA, phoR, phoB, phoE and pstSABC – and acid phosphatases – including a phosphatase PAP2 family protein which is part of cps1 gene cluster. The overall phosphatase activity (oPA) of DSM 29614 strain was investigated using samples collected from four different experimental sets: cultivations using FeC or in NaC media under anaerobic or aerobic conditions (Fig. 7). 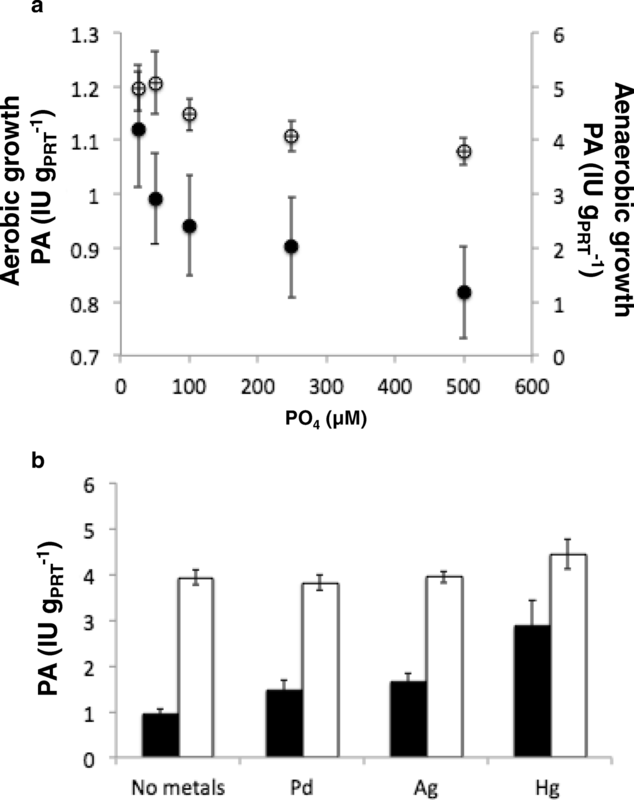 The highest oPA was observed in the NaC medium under anaerobic condition while the lowest oPA was revealed in FeC medium under aerobic condition. The Vmax and Km of oPA in cells cultivated under anaerobic conditions in NaC medium are by far the highest in respect to the other growing conditions (Table 4). 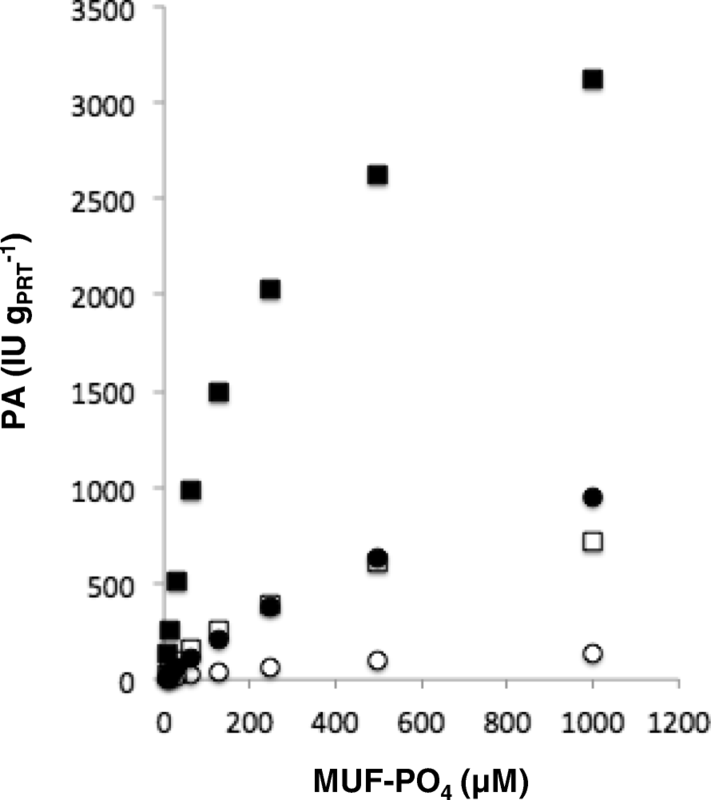 The addition of increasing amounts of inorganic phosphate to NaC medium causes a modest but appreciable oPA decrement only in anaerobic condition, with a maximum reduction of approximately 22%comparing 25 and 500 μM (Fig. 8a). On the contrary, the addition of heavy metals to NaC growth medium strongly stimulates oPA in aerobiosis only (Fig. 8b). Indeed, the formation of struvite (MgNH4PO4.6H2O) was revealed in K. oxytoca DSM 29614 cultivations performed using NaC growth medium under aerobic conditions with the addition of different heavy metals. In particular, the addition of 50 mg.l− 1 Hg2+ or Ag+ induced the formation of millimetric struvite crystals (Additional file 4: Figure S2 A and B) as well as the addition of Pd2+ induced the formation micrometric struvite crystals (Additional file 4: Figure S2 C and D). The presence of Ag+ on struvite crystal surface, inferred from crystal face darkening, was confirmed by the spectrophotometric analysis revealing a content of 0.03 ± 0.01% (w/w). The K. oxytoca DSM 29614 genome has peculiar characteristics which reveal a complex phylogenetic history of this microorganism. The results of the comparative genomic analysis performed using 85 K. oxytoca strains are in agreement with the comparative analysis of K. pneumoniae strain genomes  highlighting the enormous capacity of the strains belonging to Klebsiella genus to acquire (and use) exogenous DNA. Indeed, such genetic variability is typical of those groups of microorganisms that usually inhabit different niches and/or living in large (and complex) communities. Accordingly, members of Klebsiella genus are able to colonize diverse environments and to adapt to a range of lifestyle [52, 53]. In particular, the relative abundancies of COG categories inferred from K. oxytoca DSM 29614 genome could be ascribed to the necessity to survive in hazardous and metabolically demanding environments, like that in which the strain has been isolated. Accordingly, the DSM 29614 strain possesses the unique capability among the K. oxytoca members of growing using Fe(III)-citrate as the sole carbon and energy source under anaerobic conditions. This growth is characterized by the production of acetic acid - which is due to the involvement of CitEF, OadA, PFL, PTA and ACK during citrate anaerobic utilization  – and by the peculiar iron precipitation in the bacterial EPS - manly as nano-sized iron oxides and hydroxides  - with the concomitant massive reduction of Fe3+ to Fe2+. In general, ferric reducing bacteria, like the Gram-negative Shewanella and Geobacter spp., reduce Fe(III) to Fe(II) during the anaerobic respiration using Fe(III) as electron acceptor in a dissimilatory pathway [44–46]. As inferred from genome analysis, in the DSM 29614 strain, that does not possess genes orthologous to Shewanella and Geobacter genes involved dissimilatory pathways, cellular mechanisms controlling iron homeostasis may be taken into account for the massive reduction of Fe(III) to Fe(II), including the possible role of i) Flavin metal reductases, ii) specific efflux pumps and iii) siderophores. In addition, a direct contribution to Fe(II) production is to be ascribed to the peculiar EPS produced by DSM 29614 strain. In fact, more in general and in agreement with what described by Gupta et al. (2017) , the resistance of K. oxytoca DSM 29614 to different metals could be due to the synthesis of the EPS, which promotes metal cation entrapment and reduction with the production of metal NPs which finally resulted embedded into EPS matrix itself [10, 15–22, 25]. One of the two cps clusters identified in K. oxytoca DSM 29614 genome, namely cps1, could be responsible for the biosynthesis of DSM 29614 EPS that was characterized by Leone et al. (2007) . In fact, one of the most peculiar characteristics of this EPS is the presence of the rare sugar rhamnose and cps1 contains genes encoding a rhamnosyltransferase (BI322_RS06925) and two proteins involved in rhamnose metabolism (BI322_RS06980 and BI322_RS06985). In addition, the presence of his genes associated with cps1 is noteworthy as well (Additional file 6: Table S4 and Additional file 5: Supporting Information), since histidine was observed as a major amino acid component of protein fraction associated with DSM 29614 strain EPS . Histidine plays a role in metal homeostasis acting either as metal chelator free-amino acid and as metal-coordinating residues in proteins, like metal chaperones or histidine-rich proteins [55–59]. In addition, genes whose products are putatively involved in general and/or metal-specific resistance processes were detected in DSM 29614 genome. In particular, 149 genes were identified, globally accounting for specific resistance to 23 different kinds of metals. On the other hand, as an example of general metal-detoxifying strategies, Fe-SOD - contrasting the intracellular generation of superoxide - was so far shown accumulating in presence of Fe(III) during both anaerobic and aerobic growth (Gallo et al., 2012)  (Additional file 2: Table S2). Furthermore, phosphate salt precipitation as struvite  can play a role in general processes devoted to metal detoxification in K. oxytoca DSM 29614 as it can be inferred from TEM observations and from the oPA profile in NaC and FeC medium according to Yung et al. (2014)  and Montgomery et al. (1995) . The struvite was obtained in K. oxytoca DSM 29614 cultivations only under aerobic conditions because of favourable pH conditions (around 8; Fig. 5a) . Thus, NH4+, Mg2+, PO43− and other cations, embedded in EPS, reach the critical supersaturation conditions typical of a nucleation site. Conversely, at pH < 7 struvite does not form, although high concentrations of PO43− remains sequestered by EPS. Indeed, it has been demonstrated by EDS-SEM element-maps of Pd-Fe NPs that Pd was associated with P but not with Fe . The finding that the addition of toxic heavy metals to NaC medium strongly stimulates oPA activity only in aerobiosis (Fig. 8b) suggest that heavy metal cations can be embedded into EPS which is massively produced in anaerobiosis while they can form metal ions-phosphate salts in aerobiosis. Thus, the different effect on oPA, observed comparing aerobic and anaerobic conditions upon heavy metal additions to cultivation medium, suggests an interplay between inorganic phosphate and EPS biosynthesis that may have consequences on metal resistance of K. oxytoca DSM 29614. In this context, it was previously observed in a phosphatase-overproducing Citrobacter sp. (NCIMB 40259) grown in a bioreactor an interesting correlation between i) limitation of carbon, phosphorus or nitrogen, ii) the capability of liberating inorganic phosphate from an organic phosphate donor with the precipitation of metal cations as insoluble salt at the cell surface, and iii) biofilm formation . In addition, a clear correlation between inorganic phosphate limitation and EPS production was observed in Mycobacteria . The K. oxytoca DSM 29614 genome shows peculiar characteristics which confirm the view of an open pangenome for Klebsiella species which is in agreement with the wide distribution of member of Klebsiella genus. The K. oxytoca DSM 29614 unique capabilities of using Fe(III)-citrate as sole carbon and energy source in anaerobiosis and tolerating diverse metals coincides with the presence at the genomic level of specific genes that can support i) energy metabolism optimization, ii) cell protection by the biosynthesis of a peculiar exopolysaccharide armour entrapping metal ions and iii) general and metal-specific detoxifying activities by different proteins and metabolites. Therefore, K. oxytoca DSM 29614 strain can play a role in nano-biotechnological applications and in the study of bacterial adaptation to hazardous and metabolically demanding environments. Giuseppe Gallo and Luana Presta contributed equally to this work. This work was supported by the Ministry of University and Scientific Research - MIUR (PRIN-2010AXENJ8 to FB; FFABR 2017 to GG), Cà Foscari University (ADiR to FB), University of Palermo (FFR 2012–2013 to AMP; FFR 2018 to GG). EP was founded by an “Assegno premiale” of the Department of Biology of the University of Florence. Funding bodies had not any role in the design of the study, in collection, analysis and interpretation of data, and in writing the manuscript. Genome sequence obtained in this study was deposited in the NCBI GenBank database with accession number MKCU00000000. Protein functional enrichment analyses are available in the BioCyc database as BioCyc Public Smart Tables (internet address https://biocyc.org/smarttables) with the titles “Enriched with FEPCU from anaerobic Vs aerobic growth on FeC up-regulated proteins” and “Enriched with FEPCU from FeC Vs NaC during anaerobic growth up-regulated proteins”. AMP, RF and FB conceived and designed the experiments. GG, LP, EP, MG and DM performed the experiments. All the authors contributed to write the manuscript and read and approved the final version.